The face of publishing has changed dramatically in the last 10 years. As budding writers, most of us stored away bits of information about the publishing world as we dreamed of our next story. Now, many of our early conceptions are being challenged and changed. 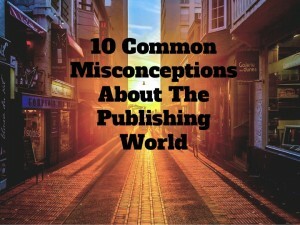 Don’t get caught living in the past – get up to date on today’s standards and avoid these 10 common publishing misconceptions. I don’t know how many times I’ve heard it from professionals in the industry, but the general rule of thumb is that your first published manuscript is usually the third book you’ve written. They say this because there is a learning curve with most writers. For most writers, their first effort will often be good by the end, okay in the middle, and kind of sloppy in the beginning. 9 times out of 10 it is obvious to agents and publishers that the writer was cutting their teeth on this one. That’s not to say it doesn’t have promise, it is just not likely to be the first published book. This statement may be true of one out of every thousand-or-so writers but for the average author this is, I’m sorry to say, not true. We all need help – even editors. Quite simply, we become so acclimated and accustomed to our story that our mind will read what we expect to have written instead of what is actually there. A fresh set of eyes will do wonders for anyone’s work in progress. This often comes up immediately after I hear #2. In the distant past a traditional publisher might buy a book on concept or style alone with the prospect of working with the author to ‘fix it up.’ The harsh reality of today’s market place is that a near perfect product is the new standard – for first time authors. The big publishers don’t have the time or the resources to spend on an untried newbie. The risk of taking you on as a client needs to be minimal. Remember, they are in this to make money not to further along the literary genius of the world – although I’m sure they would like to think they are doing both. There is a sliding scale to consider here which corresponds directly with how you plan to publish your book. The big traditional publishing houses will often tie your hands. Sure, you do any content editing necessary. But your title, your cover art, how your book gets marketed, and other fine details are left in the ‘capable’ hands of the professionals. With smaller publishing houses you’re likely to have some say in the final product but in the end the decision is ultimately up to your publisher. Now, if you choose to self-publish you have all kinds of control – just make sure you know what you’re getting into before taking on all that responsibility. Some are, but most are not. There’s something called the 10% rule that accounts for human error when proofreading. It basically means that an edited manuscript could potentially have typos, word confusion (your, you’re/ there, their), missing letters, missed or wrong punctuation… you get the idea. Even books published by major publishers often end up with these kinds of errors, despite the best efforts of everyone involved, including multiple proof readings. If you’re a savant with Photoshop or went to school for graphic design you might stand half a chance at putting together a good book cover. You need to know a lot about the industry before you jump in to this project: what images are selling? Does your target market like simple or complex covers? Do you have access to the right kinds of font for typesetting? Are your images of high enough quality? Does it look professional? You will have a say in your cover design if you hire a professional, but ultimately you’re purchasing their expertise in order to give your book the chance it deserves – and that will often take a leap of faith. Maybe. Probably not on your first or even your second book. It depends on how narrow the niche market is that you’re dealing with. You definitely have the potential to make more money as a first time author but that all depends on how you market your book and yourself – and that takes money. Now, I’m not saying you can’t publicize yourself for free. It can be done, but likely you’ll be spending more time finding new ways to get noticed for free and less time writing your next book. The average first time self-published author (excluding writers of romance) will be lucky to break even. With costs for editing, cover art, formatting, business cards, printing books, etc. you’d be surprised just how fast your costs rise. Again, maybe. If a large publishing house offers you an advance on your earnings it’s because they know they can sell a certain number of copies of your book. Generally this is not the case with small publishers. They are often investing in you as an artist and are taking a risk by signing you – meaning you’ll get paid after your books are sold and not before. If you’re given an advance of $5,000 but your book only pulls in profits of $3,000, then you owe $2,000 or you don’t make another cent until you’ve paid your publisher back with the sales of your next book. Just be sure you know what you’re getting into before you sign on the dotted line. Sort of. I touched on this briefly above but the frequency that this statement finds its way into the mouths of new authors is frightening. Your publisher sees you as a small-fry and a risk. They may have great hopes for you and your work but if you don’t already have a name for yourself then they will spend a minimum amount of attention on you. But be forewarned – even though your publicity has now landed squarely in your lap, you don’t have free-reign to market yourself. More than likely there is a clause in your contract that restricts you from negative-publicity on the manuscript in question… no DIY podcasts of chapter readings, no free content external to the book that hasn’t been pre-approved by your publisher, and much more. I can’t believe how many new authors are swayed by the power of the internet and are forgetting their grass roots. If you want to build buzz and get people talking about your work, you need to get out there and talk about it too. Forums, blogs, groups, and pages are all great tools that should not be ignored. Word-of-mouth started with two people standing in line talking about the weather. By turning yourself into a local celebrity you weave a physical networking web. Make the time to read at local festivals, the library, visit a school, hold a seminar or workshop, sign some books, get on the cable channel and local radio station – make some noise. You deserve a fighting chance at getting published and being noticed. Learn the ropes and maybe tie a few new knots of your own while you’re out there. The times they are a changin’ so why not get ahead of the game and revitalize what it means to be an author in the 21st Century.